Scroll down to see the top not-for-profit colleges offering social work degrees online. Students interested in starting or advancing their career in social work can earn a relevant degree online through Aurora University. The online Bachelor of Social Work is an adult degree-completion program designed for students who already have some college credits. In addition to online coursework, undergrads take part in field instruction courses. The online Master of Social Work program gives students a choice of concentrations, including clinical social work, faith-based social work, and health care social work. Master's candidates also receive more than 1,000 hours of field instruction. Online courses are arranged in five- to eight-week sessions, and students can take classes year round to speed the time to graduation. Baylor University offers a Ph.D. in Social Work online. The program uses a combination of online courses with classes taught in virtual classrooms by synchronous, high definition videoconferencing. The program takes three years to complete and requires 60 credit hours, and only seven students are admitted to the program every year. Students who have an M.S.W. from an accredited school of social work will be considered for the program. Baylor University has a unique approach to the field of social work that combines faith and ethics. Students in this program will take courses such as Theory and Model Development for Social Work Practice and Religious and Cultural Diversity. The School of Social Work at Boston University offers a Master of Social Work online, and the school is dedicated to economic justice in all of its programs. The goal of the program is to further the education of social workers and equip them to be unique leaders in a diverse, complex, and multicultural society. This online program is specifically geared towards students that have work and/or family responsibilities. The degree is available in three tracks: the traditional M.S.W. track, the human service experience track, and the advanced standing track. In this program, students will complete one or two field internships in their own communities. Brandman University offers a Bachelor of Arts in Social Work online. The program focuses on the diverse areas of political, cultural, social, economic, organizational, and technological processes that create change in society. The program has professional accreditation candidacy status from the Council on Social Work Education (CSWE), and graduates of the program will be prepared for entry-level positions in the field of social work in areas such as developmental disabilities, community mental health, child welfare, addiction, and more. Students enrolled in the program will take courses such as Human Behavior and the Social Environment, Diversity and Social Justice in a Global Society, and Interviewing and Assessment Skills. Brescia University offers a Master of Social Work online. Professional social workers are in high demand, and the M.S.W. program at BU is designed to prepare individuals for successful careers in the field of social work. Weekly, evening synchronous chats are required for all students so there are plenty of opportunities for face-to-face interactions with classmates and professors. The M.S.W. program can be completed within two years. Students who have a B.S.W. may qualify for the advanced standing track, which may be completed in one year. Students enrolled in this program will take courses such as Human Behavior in the Social Environment, Ethical Decision Making in Social Work, and Psychopathology. Briar Cliff University has an online program that allows adult learners to complete their undergraduate degree in social work. There is no requirement to go to campus. Students complete coursework online and have a weekly one-on-one meeting with a faculty mentor, which is conducted via Skype. Courses are asynchronous, allowing students to log in and view coursework at their convenience as long as they meet weekly deadlines. Students must also complete a 450-hour hands-on field experience, which they can do in their own community. Students may enter the program in the fall or spring term. Applicants must have at least 77 credits and meet prerequisites; an associate degree in social work typically meets most of these requirements. Students can earn a Master of Social Work in a fully online program offered by California State University Northridge. The online program is a full-time program that uses a cohort format and allows students to earn their degree in two years. Most of the coursework is asynchronous, but students typically attend a live online session one night a week in each class. Students are required to take part in field practicum, so an appropriate placement must be available near where the student lives. Applicants should have a bachelor's degree in psychology, sociology, or a similar field with a GPA of 3.0 or higher. This program prefers students who have work experience. Campbellsville University has online programs leading to both a Bachelor of Social Work and a Master of Social Work. The online bachelor's program includes only the core curriculum in social work, so applicants should have an associate degree or be able to transfer credits for general education requirements. Undergraduate social work majors must complete 450 hours of direct field practice spread over several terms. Students can complete the degree in as little as two years. The master's program has a 30-credit advanced standing option for students who majored in social work as undergrads and a 60-credit foundation track for students new to the field. To earn the master's, students must complete 900 practicum hours, including hours from their undergraduate program. The Jack, Joseph, and Morton Mandel School of Applied Social Sciences at Case Western Reserve University offers a Master of Science in Social Administration online, and the school is fully accredited by the Council on Social Work. The degree is available in three different concentrations: Direct Practice (Children Youth and Families), Direct Practice (Adult Mental Health), and Community Practice for Social Change. All students are required to complete a field education portion of the program. The traditional track for students who do not have a B.S.W. is a total of 60 credits, and the advanced standing track is a total of 45 credits. The Master of Social Work program at Colorado State University uses a hybrid format. Students do most of the coursework online, but twice each semester students attend a weekend class with their cohort in Denver or Colorado Springs. This program has an advanced generalist focus, and students can gain specialized knowledge by working on a graduate certificate while earning their degree. Students without a social work background can complete the program in three years. Individuals with a social work bachelor's degree are eligible for advanced standing and can complete the degree in two years. Field experiences are required in this program. The School of Graduate Studies and Research at Edinboro University offers a Master of Social Work program entirely online, and it prepares students to work in a variety of settings and contexts. Some of these settings may include schools, addiction treatment centers, family-based and mental health agencies, medical and psychiatric facilities, hospitals, and nursing homes. The M.S.W. program is fully accredited by the Council on Social Work Education (CSWE). Students are required to complete a field education component of the program. The Graduate School of Social Service at Fordham University offers an online Master of Social Work, and it is the same as the traditional M.S.W. program offered by Fordham University, which was ranked #11 in the nation by U.S. News & World Report. The online M.S.W. program is ideal for students with busy schedules who require a certain amount of flexibility and convenience. Students are able to complete field placements in their own areas with supervision of the Fordham University faculty. Louisiana State University offers a Master of Social Work degree program online. This program enables students to seek rewarding careers as social workers in areas such as gerontology, substance abuse treatment, child welfare, and more. Online courses are taught in seven-week sessions, and the degree can be completed in two years or in one year if the student has a bachelor's degree in social work. There is a thesis option and a non-thesis option for M.S.W. students. In the first year, students will take foundational courses such as Social Welfare History and Policy, and in the second year (otherwise known as the advanced year), students will participate in field internships with the approval of the expert faculty. Metropolitan State University of Denver has a fully online option for the Bachelor of Science in Social Work that is available only to students who live in Colorado. While classes are all delivered online, they are not always asynchronous, and students are required to be online at set times for some learning activities. Students also have to complete a field placement, which requires 16 hours a week and takes place in the senior year. The social work degree requires 120 credits, including 55 credits in required social work courses and up to seven credits in social work prerequisites. The Worden School of Social Service at Our Lady of the Lake University offers an online Master of Social Work program. The goal of this degree program is to equip individuals with the necessary skills, knowledge, and experience to contribute to pursue fulfilling careers in social service leadership and also advanced direct practice. The program can help students to achieve their goals of fighting for justice and helping society. There are two options: the M.S.W. Concentration track, which is geared towards students who already have a B.S.W. and can be completed in two years, and the M.S.W. Foundation track, specifically designed for students with a bachelor's degree in something other than social work. Portland State University's Master of Social Work is a low-residency program that allows students to complete roughly 90 percent of the coursework online. The program includes scheduled virtual meetings with instructors and classmates, and team-based assignments. Online courses are delivered in an 11-week term, with each course broken into modules. At the start of each academic year, students must come to Portland, Oregon, for an annual seminar. Candidates are able to perform their required supervised field placements near their home. The online MSW is a three-year program that requires 78 credits, and Portland State is home to the only accredited online MSW program in the Pacific Northwest. Rutgers University has a 100-percent online Master of Social Work in Clinical Social Work that uses asynchronous classes. Students who are new to the discipline can complete the degree in three years. Applicants with a Bachelor of Social Work from an accredited school can receive advanced standing and finish in four semesters. All students take part in field education near where they live and are supervised by online faculty. Students can enter this program in the fall, spring, or summer semester. Rutgers also has a blended MSW program where the first two years of classes are asynchronous online classes, with some in-person classes in the third year. Students can choose which Rutgers's campus they will attend. Saint Leo University offers a Master of Social Work program entirely online in two different concentrations: Advanced Clinical Practice Concentration and Advanced Standing Program. The Advanced Standing Program takes one year to complete, and it is meant for students who have completed a B.S.W. degree from a CSWE-accredited program within the last five years. In both of these programs, classes are attended via webcam and presented online, which allows students the opportunity to have face-to-face interactions with professors from the convenience of their own homes. Students enrolled in the M.S.W. online program will take courses such as Human Behavior in the Social Environment, Social Welfare Policy, and Social Work Research Methods. 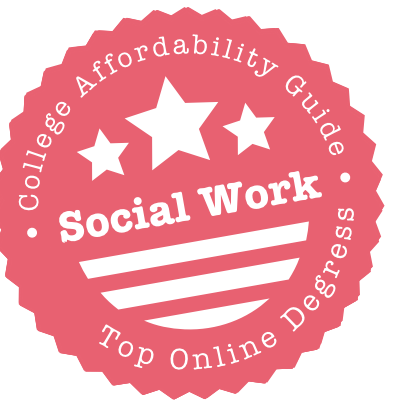 The Department of Social Work at Salisbury University offers an online Master of Social Work program, and it is accredited by the Council on Social Work Education. All of the courses in the program are offered in seven-week blocks, and most students complete the program in three years. Students must complete an online orientation, and there is an assessment on the Salisbury University website to help students determine whether or not online learning is for them. Students enrolled in the program will take courses such as Psychopathology and Ethics, and all students are required to complete a field work component for the program. The University of Alabama offers a Master of Social Work online, and the program is accredited by the Council on Social Work Education. Students in the M.S.W. program will have an increased knowledge of social problems and also their solutions, develop the necessary skills to promote human dignity and social justice, and understand how to improve social conditions for individuals and communities throughout the nation. Students who have a B.S.W. are able to pursue the 42-credit advanced-standing program. Students enrolled in this program will take such courses as Models and Methods of Social Work Practice with Adults in Mental Health, Advanced Social Welfare Policy Analysis, and Human Behavior and Social Environments. The University of Tennessee Knoxville has three options for an online Master of Science in Social Work. The Advanced Standing program is open to students with a bachelor degree in social work and a GPA of at least 3.0. The 36-credit program can be completed in 12 months of full-time study or 18 to 24 months of part-time study. The program starts in the summer. The full-time online option starts classes in the fall, and students can complete the 60-credit program in four semesters. Part-time students begin in the fall, take six credits per semester and earn the degree in three or four years. Advanced standing students complete one field placement and other students complete two field placements. The University of Texas at Arlington uses a cohort format for its fully online Master of Social Work program. Students can choose from three specialty areas: direct practice with children and families, direct practice in mental health and substance abuse, and direct practice in aging. The aging program is limited to students who qualify for advanced standing. The online cohort begins the program in the fall, and admission to the online program is restricted to individuals who are Texas residents. To qualify for advanced standing, an applicant must have earned a Bachelor of Social Work within six years prior to starting the master's program and must have a GPA of 3.0 for the last 60 credits. Applicants with a bachelor's degree in social work might quality for two advanced-standing online master's degree programs at the University of Texas Rio Grande Valley. The options are Master of Social Work-Direct Practice with Latino Individuals, Families, and Groups or MSW-Administration and Community Practice. Each degree is a 33-credit program that students can finish in as little as one year. Students in either specialty are required to complete two practicums. Applicants must have a Bachelor of Social Work from a CSWE-accredited school with a GPA of 3.0 overall and 3.2 on core social work classes. Applicants must show they have passed a basic course in statistics. Union Institute and University has an online Bachelor of Science in Social Work that students can complete on a full-time or part-time basis. Graduates of the program are prepared for a generalist social work job in a community or organization. The social work curriculum includes courses in human behavior and the social environment, ethical issues, working with families, multicultural issues, social welfare policy, and research methods. Students are able to complete practicum hours by working with a social work agency in their home community. UIU will accept up to 90 transfer credits, and the university allows students to enter the social work program at three points during the year. The online Master of Social Work at UCF is a part-time program with seven-week terms. Students without a recent BSW take just one course at a time. The 21 core credits introduce them to client populations, intervention approaches and other foundational topics. An additional 18 credits are dedicated to clinical specializations, so enrollees can learn the difference between, say, working with families and individuals. After nine elective credits, students round out the program with 14 combined credits of generalist and clinical field education. Earned a BSW within the last five years? That puts you in the advanced standing program, which removes the core requirements, one elective, and generalist field education. The final tally is 32 credits instead of 62. MSW@Denver seeks to build from the University of Denver's reputation as a top graduate destination for Social Work. Since the advanced standing MSW is only available on-campus, the online program is strictly for applicants without a Bachelor of Social Work. (They can hold a baccalaureate in any other discipline.) Those admitted will spend the first four quarters building a foundation in the topic. The remaining five quarters are dedicated to a concentration in Mental Health and Trauma. Students take one field internship during each of these periods, the first to discover what they love and the second to focus on it. The online MSW at UH focuses on Clinical Practice, and students may specialize in Health and Behavioral Health. The degree utilizes a cohort system, although students select their own electives. The first term starts with a quick pass/fail introductory course before getting into meatier work - six credits in foundational classes and a further three dedicated to Research Methods. The second term is all field practicum. Thanks to a summer term, students finish all 64 credits in three years, logging four practicums along the way. Enrollees in the advanced standing degree plan compete the same number of practicums but far fewer courses, making it through 38 credits in two years; that program is for enrollees with a BSW. The Master of Science in Social Work (MSSW) at Louisville has two starting points so that students can apply regardless of the type of baccalaureate they hold. Enrollees without a Bachelor of Social Work (BSW) attend the regular 60-credit program, which starts in the fall. They'll spend a year or so checking off foundation level courses and two practicums. Enrollees with a BSW skip that phase and go straight into the 30-credit Advanced Standing program, where they'll complete advanced practicums, practice and research. They'll choose three electives to fill out the curriculum. This is where students have a chance to specialize in one of five areas, including Military Social Work and Gerontology. The College of Human Environmental Studies at University of Missouri offers an online Master of Social Work program for students who have earned their Bachelor of Social Work from an institution that is accredited by the Council on Social Work Education. Graduates of this program have gone on to pursue careers in advanced clinical practices or policy, planning, and administration in human services, among other things. Students enrolled in the program will take courses such as Advanced Social Work Practice in Integrated Health Care, Problems in Social Work, Helping Strategies with Children and Adolescents, and Military Culture: Issues for Helping Professionals. The University of New England offers an online Master of Social Work, and it is one of the few online programs that is accredited by the Council on Social Work Education. The mission of the School of Social Work is to contribute to a world where social workers mobilize efforts to end exploitation, violence, and inequality. The program is available in a traditional track, which is ideal for students who do not have a bachelor's degree in social work. Students who do have a bachelor's degree in social work may be interested in the advanced standing track. Students in the advanced standing track will take courses such as Integrating Clinical/Community Practice Framework and Administration and Supervision. The University of New Hampshire online offers a Master of Social Work that can be completed entirely online, and it is accredited by the Council on Social Work Education (CSWE). The program takes 28 months to complete, and it focuses on four fields of practice: health and mental health, youth and families, disabilities, and addictions and substance abuse. Students are required to participate in two field internships in their local areas. These will both be nine months each. Students enrolled in the program will take courses such as History of Social Welfare Policy, Human Behavior and the Social Environment, and Social Welfare Policy. The Virginia Commonwealth University School of Social Work offers a Master of Social Work degree online. The program is accredited by the Council on Social Work Education, and the goal of the program is the educate individuals who wish to pursue advanced practice in social work administration or clinical social work. The VCU School of Social Work places emphasis on critical thinking, data-based decision making, and self-awareness. Students in the program will be equipped with a foundation of skills, knowledge, values, and ethics that are essential for working in a social work context. The Bachelor of Social Work at Wayne State is the school's only online undergraduate degree - yet that was enough to rate it 28th on U.S. News & World Report's overall list of Best Online Bachelor's Programs in 2017. The program weaves four themes into every course: values and ethics, social justice, oppression and discrimination, and populations at risk. Field work, which spans both semesters of senior year, addresses these areas as well. In addition to applying for dozens of departmental scholarships, BSW enrollees can vie for $3,000 courtesy of the Brehler Student Manuscript Competition - the manuscript combines introspective personal essay with theoretical commentary. Online bachelor’s degrees in social work are most common. Online master’s degrees are rarer and concentrations are sometimes limited to Advanced Generalist or Clinical Social Work Practice. However, you may be able to specialize in an area of particular interest (e.g. urban family practice, family social work). If you’re not interested in licensure, then you have considerably more flexibility. For example, you could consider an online master’s degree in social services, social science, human services or other related disciplines.